Preparing to test water at COALESCE! A variety of bottled waters. 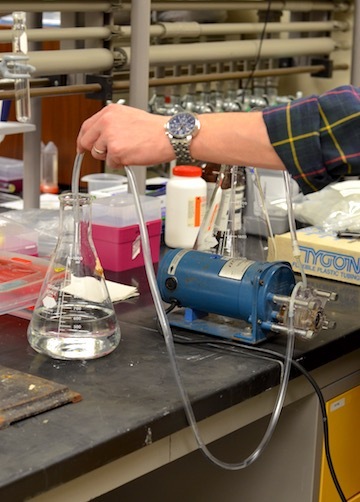 Pumping water samples through a filter for solid state extraction. The pump "drinking" Just Water brand tetrapak water. We were interested in determining if commonly available commercial foods and processed food products were contaminated with endocrine disruptors. We believed the likelihood was high that many commercially grown agricultural products, and liquids packaged in plastic, would have some contamination and designed an experiment using solid-state extraction and a test called ELISA (or "enzyme-linked immunosorbent assay") to determine if this was correct. ELISA allows testing for antibodies and antigens by “sticking” the antigens or antibodies to a substrate and allowing them to be color marked. It is often used to diagnose diseases in humans such as Lyme disease, HIV, and allergies. Because endocrine disruptors are antigens capable of creating antibodies, the commercially available but cost-intensive ELISA testing system can be used to indicate their presence. We purchased food and water samples from several locations in Buffalo, NY and conducted solid phase extractions at COALESCE Bio-Art Lab at SUNY Buffalo, where Byron was an artist in residence. The items we tested included several types of apples and a variety of bottled waters. None of the apples, whether commercially produced or organic, tested positive for endocrine disruptors.